What Are the Enemies of Parakeets? A parakeet, also called a budgerigar or budgie, is a type of small- to medium-sized parrot with a long tail. There are more than 120 species of parakeets found around the world, especially in warm climate areas such as Australia, as well as Central America and South America. Because these birds are colorful, social and intelligent, they are often kept as pets. Parakeets crave attention and can often mimic sounds including human words. 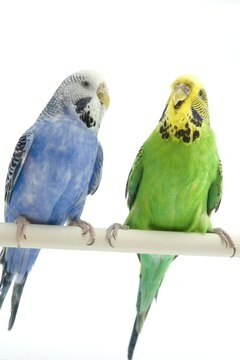 While these birds do not have many predators, both in the wild and as pets, parakeets can come across several enemies. Despite being part of the bird family, large birds can prey on other birds such as parakeets in tropical environments, especially during the nesting season of parakeets, which is when parakeets build nests and lay eggs. Large birds, such as varieties of eagle and falcon species, are the most likely to be enemies of the parakeet. These birds are considered raptorial birds, meaning they hunt and kills other animals. In fact, these birds have been known to not only kill parakeets, but also large parrots such as the macaw. In places like the Amazon rainforest in South America, snakes and monkeys often climb tree vines to reach young parakeets who are nesting in trees. These snakes and monkeys can prey on the eggs of parakeets and other parrots as well. When a flock of parakeets recognizes that a fellow parakeet is in danger, they often become silent, before suddenly creating loud noises to distract and confuse the hunter. Because parakeets are often kept in cages as pets, they are usually safe from domestic cats. However, both domestic and wild cats prey on birds, especially when these cats live in outdoor environments and are not fed regularly by their owners. Cats who are fed well and live indoors are less likely to become enemies of birds, but can still be considered a threat to any bird, including parakeets that are not caged. Parakeets can be an enemy to themselves when left in solitude for long periods of time. Parakeets thrive on attention and form strong bonds with other parakeets, as well as humans. When kept as pets, parakeets require a cage full of stimulation including climbing areas and toys or other parakeets to keep them from becoming bored. If parakeets become too bored or if they are left alone for long periods of time, they may begin to pluck or chew their feathers, causing self-mutilation, as well as become depressed.